Kpreps.com is proud to announce another excellent group of finalists for the fifth annual Get Busy Livin’ – Kpreps Player of the Year Award in conjunction with the Dylan Meier Foundation. The 2015 award finalists include Blake Beckett of Halstead, Brady Dinkel of Victoria, Tucker Horak of Rossville, Logan Koch of Mill Valley, Will Mengarelli of Pittsburg, and Ryan Menghini of Frontenac. The award is in honor of Dylan Meier, a former All-State quarterback at Pittsburg High School and starter at Kansas State University who died in a hiking accident in 2010 at the age of 26. The annual award goes out to one Kansas high school senior who not only has shown excellence on the field but also has demonstrated the values that Dylan embodied and Get Busy Livin’ (GBL) strives to promote: adventure, fitness, curiosity and a daily zest for life experiences. Past award winners include Denzel Goolsby of Bishop Carroll in 2014, Austin Chambers of Shawnee Mission West in 2013, Brad Strauss of Lawrence in 2012, and Kole Schankie of Madison in 2011. 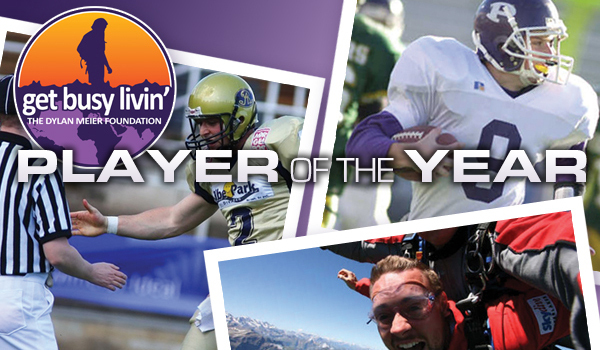 The award is made possible by the Get Busy Livin’ Foundation and Kpreps.com. As a junior, Beckett cleared 2,100 rushing yards and broke 19 school records. Last fall, Beckett suffered a knee injury during the third quarter of the seventh game. He rehabbed, missed the final two regular season contests and returned for the playoffs. Beckett never complained of the pain during the season, but recently said it was a “9 or 10 pain definitely” on a 10-scale. Brady Dinkel helped lead Victoria to a huge season-opening home victory against Central Plains in a matchup of defending eight-man state champions. Dinkel, the team’s all-state quarterback/safety, felt ill shortly after the contest and then eventually went to the emergency room in Hays. Then, Dinkel was eventually life-watched to Wichita with significant internal problems. Victoria coach Doug Oberle, among others, never thought Dinkel would play football again. However, Dinkel progressed quickly and believed he would return. Dinkel, the oldest of three, discussed returning with his parents. Dinkel, who first returned as an all-purpose player and safety in Week 9, again took over at the starting quarterback when incumbent Joe Dortland suffered a season-ending collarbone injury in the first snaps of the sub-state championship game at Wallace County. Dinkel capped his career in a remarkable way when he rushed 56 yards on 4th-and-1 on the game’s final offensive play to cap a perfect season for the Knights and Eight-Man, Division II state win versus Argonia-Attica. It marked the second undefeated year in tradition-laden Knights history. Dinkel, who started at guard in basketball and is one of the top players for Victoria-Russell baseball, said he in no pain. Dinkel has even considered playing college football at Fort Hays. Off the field, Dinkel and his family are very active with church in Victoria, a strong Catholic town. “Just my experiences that I have had – I just know that any minute could be your last, so you need to live life to the most of its potential, that way you get everything out of it that you can,” Dinkel said. Tucker Horak has enjoyed one of the most decorated careers in Kansas high school football history. Horak paced Rossville to back-to-back perfect seasons and 3A titles, the first football crowns in school annals. A Pittsburg State signee, Horak finished this past season with 47 rushing scores and 30 passing. A MaxPreps Small School All-American, Horak had 12,242 total yards of offense, including 6,790 rushing. He made Sports Illustrated’s Faces in the Crowd in December. He ranked sixth all-time in the nation for total offense. Horak credited his teammates for blocking and opening holes. He became the first Kansan with 2,000 rushing and passing yards in the same season last fall. “There’s not really a whole lot to see, just see the big hole that they make for me,” Horak said. Horak was a football team captain the past two seasons, carries a 3.5 GPA, is a first grade mentor and Shrine Bowl volunteer. As well, he has volunteered with his church and the Rossville Community Tall Corn Festival. Off the field, Horak is most proud of helping with the Rossville flood in summer 2015. The team helped move furniture, fill sand bags and supply food. “It just shows how nice it is to be from a small town, and how truly blessed we are to know everyone and have everyone in there helping out,” Horak said. Several times, Mill Valley coach Joel Applebee said quarterback Logan Koch competed “like no other kid that I’ve ever coached.” Koch and all-purpose threat Christian Jegen were the fulcrums that took Mill Valley, 5-5 in 2014, to a 12-1 record and Class 5A state championship last fall. The Jaguars won the first football crown in school history. Koch said “coming back” from 2014 and the huge improvement was his proudest moment. Even from 7-on-7 and summer weights, Koch saw potential in his team. Koch rushed for 781 yards and 13 scores, and passed for 2,483 yards and 32 TDs. A four-year starter on the hardwood, Koch signed with Eastern Illinois for basketball. Applebee said Koch has a “high degree” of integrity, responsibility and ambition on the football field and classroom. Koch served in multiple capacities and carried an A/B grade-point average. “All of the hard work paying off,” he said. Because of the Meier family’s connection to the area, Pittsburg High School has a Dylan Meier Most Inspirational Award for the Purple Dragon program. Linebacker Will Mengarelli, a three-year all-conference linebacker, has won the award the last two seasons. He called winning the Dylan Meier honor greater than even all-state. Pittsburg coach Tom Nickelson called Mengarelli the “true heart and soul” of Pittsburg football. Mengarelli strives to be nice to everyone and give full effort in everything. Mengarelli gave credit to his family, going back to his great-great grandfather, Henry, who moved from Italy, along with grandfather and dad. Henry moved to 50 Camp in southeast Kansas went he was 14 and lived with a family. He worked in coal mines for 8-10 hours a day, then he would farm for another six and then sleep only a few hours a night. Frontenac’s Ryan Menghini called his greatest achievement simply being part of the football team with head coach Mark Smith. Even as a freshman, Menghini looked to help his team. He eventually collected all-league honors three times and served as a team captain in 2015 when he collected 974 offensive yards, 12 scores and 80 tackles. Smith said Menghini was the best leader he’s ever seen. Menghini never missed a day of weights and had tremendous work ethic with football and in the classroom. Menghini has always tried to get involved with the community and helped in a variety of ways, including helping with JV and youth games, set up/cleaned up Festa Italiana, pumpkin distribution, Special Olympics, church and community service projects and raking leaves for the elderly in Frontenac. He has deep respect for the Meier family and the Get Busy Livin’ honor. Luke Schemm, RB/LB, Sharon Springs-Wallace Co.